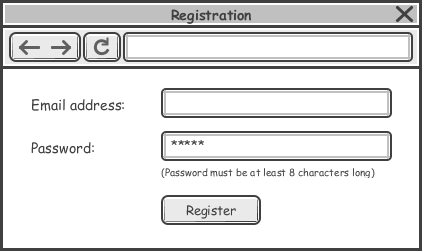 A wireframe state is a snapshot of wireframe throughout an interaction. Generally speaking, a state changes when an event occurs. 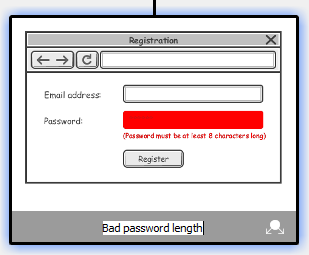 For example, an entry of text in text field, a click of a button, etc. 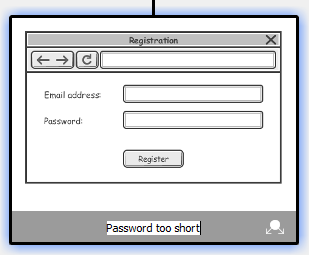 Visual Paradigm supports wireframing. 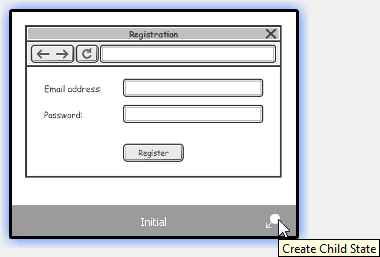 You can create wireframe and represent the modifications of screen over time by defining states. Open the wireframe where you want to add a state. Click on Show State Overview at the top-left of wireframe. This opens the state overview with states placed on a corkboard-like background. Click Create Child State below the Initial state to create a child state under it. Name the wireframe state meaningfully to reflect the change of the wireframe at this particular state. Press Enter. This opens the wireframe state for editing. You can check the editing state by referring to the diagram title. You can now start editing. 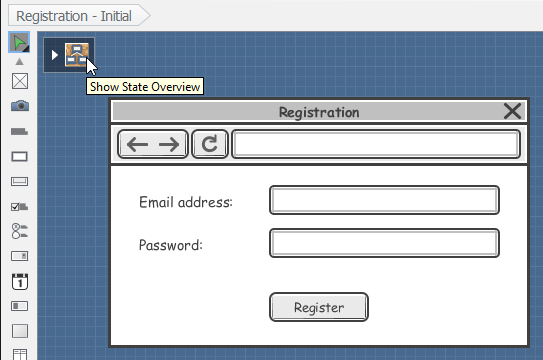 The state overview shows you the thumbnails of wireframe states plus the differences between parent and child state. The modified regions are paint in red. 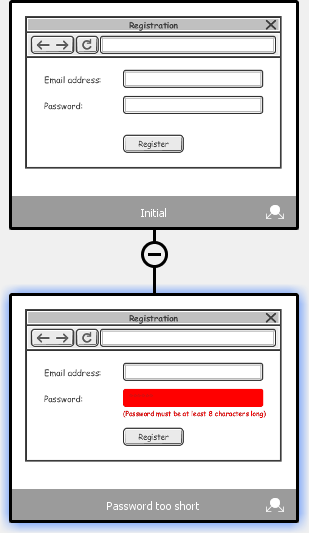 You can check the red regions to identify the changes made in a particular wireframe state. If you are failed to read the thumbnail clearly, you may double click on a thumbnail to open it or adjust the zoom ratio by dragging on the slider at the top of the overview. If I add a new button in parent state, the same button will appear in its child state. If I removed a button in parent state but that button has not been modified in its child state, the button will still be removed. If I renamed the caption of a button in parent state but the same button has not been renamed in child state, the caption of the button in child state will be renamed. 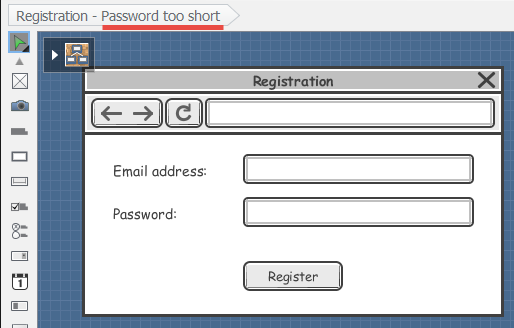 Note that if the button in child state was resized, the renaming will still take place. If I renamed the caption of a button in parent state and the same button has been renamed in child state, the caption of the button in child state will remain unchanged. Open the wireframe where you want to edit a state. Click on Show State Overview at the top left of wireframe. Double click on the thumbnail of the state that you want to edit. The wireframe state is opened and you can start editing. Open the wireframe where you want to rename a state. Click on Show State Overview on the top-left of wireframe. Double click on the name under the thumbnail of the state that you want to rename. Enter a new name and press Enter to confirm editing. 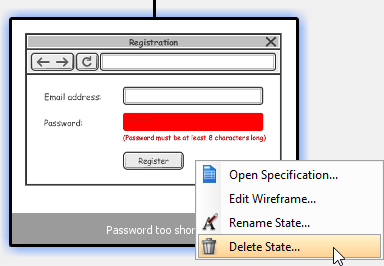 Open the wireframe where you want to delete a state. Right click on the thumbnail of the state that you want to delete and select Delete State… from the popup menu.